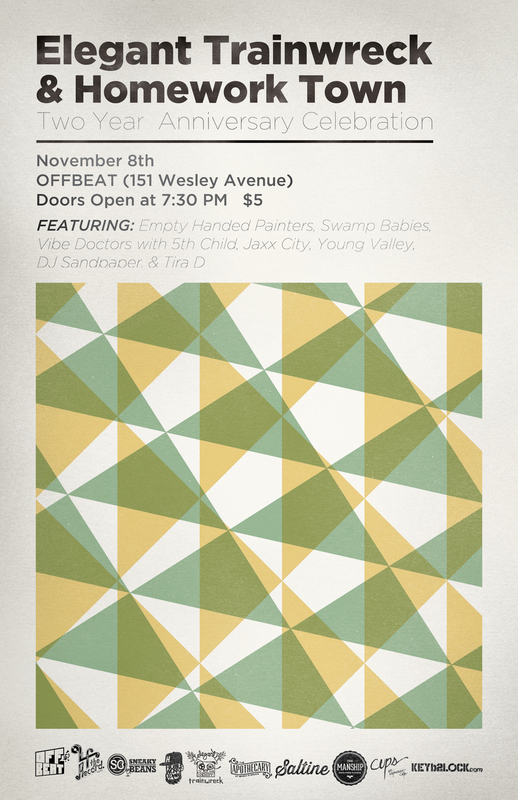 On November 8, Jackson, Mississippi, based independent record labels Elegant Trainwreck and Homework Town will be celebrating their 2nd anniversary with a special show at Offbeat (151 Wesley Avenue) in Midtown. Label-mates Empty Handed Painters, Jaxx City, and Swamp Babies will be performing along with friends of the labels DJ Sandpaper, Young Valley, Tira D, and Vibe Doctors, who will be performing a one of a kind set with 5th Child. Elegant Trainwreck and Homework town came together in the summer of 2012 when Garrad Lee approached Cody Cox about starting a new label to be attached to his label, Elegant Trainwreck, where Cody had been releasing music from his projects (Furrows, Liver Mousse, his solo projects). Cody had been thinking about expanded the label into some new terrain. Garrad’s idea for Homework Town was to provide a label in Jackson with an eclectic roster that reflected the diversity in the Jackson music scene while also working to merge any gaps the kept different genres and scenes separated. Later in 2012, Cody and Garrad decided to make Homework Town an imprint of Elegant Trainwreck and work started on the first releases. On November 12, 2012, the labels celebrated their merging with a show at Morningbell Records and Studios in Jackson with a release party for the labels’ first two releases, James Crow’s “Religion, Guns, and Money” and a split 7” vinyl record featuring Liver Mousse and 5th Child, a record that, by combining a garage rock band and a hip hop act, fully reflected the core mission of bringing different scenes together. Later in November, Liver Mousse, James Crow, and 5th Child played another show together in Knoxville, TN before sharing numerous bills in Jackson the following year. Since the merging of the labels, they have also released albums from That Scoundrel, Jaxx City, Swamp Babies, Dream Cult, Empty Handed Painters, and Furrows, with a whole host of other Jackson artists from all across the spectrum scheduled to release music in the coming year. The 2nd Anniversary show brings together artists that have released albums this year with a peak into some of the things the labels have in store for the future. The show will also feature numerous special deals on releases and merchandise as well as raffles and giveaways throughout the night.